Altars of Remembrance are things, places, quotes and moments that mark our lives. In the month of December, I will be sharing four of my life’s markers. This was the topic I spoke on at a recent women’s retreat. I hope you will be encouraged and stay tuned for the remaining posts. Rinse and Repeat is a phrase used to indicate the continual repetition of an action or sequence of events, typically in a way regarded as tiresomely predictable. I find that if I am not intentional and tiresomely predictable I will become easily distracted and forget what I am about, what my true purpose is. There are four Markers or Altars of Remembrance that I know God has asked me to live by. These markers are filters for how I want to see the world and those I interact with. The year was 2014 and our theme for the Blossom Retreat was “Bloom Brave”. 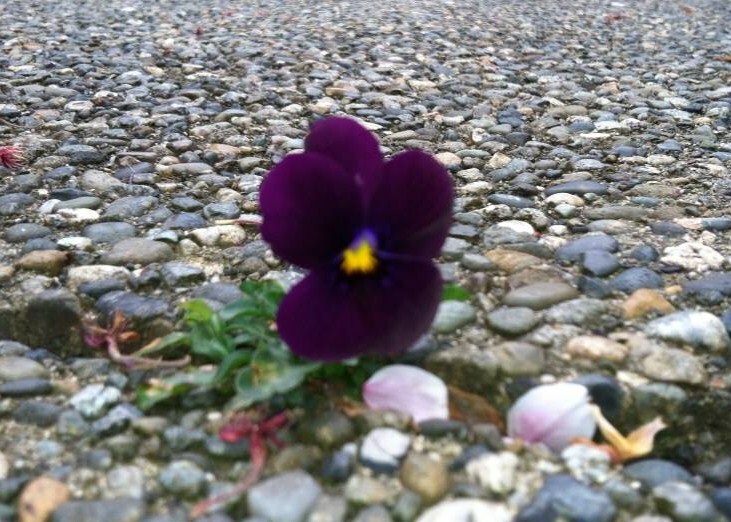 You may have noticed the beautiful violet growing out of the sidewalk in the photo above? Bravely blooming all alone! As the Blossom team continued to prepare for our Bloom Brave event we encountered the opportunity to include a group of women from a ‘neighboring’ church who did not all speak English. At some point in the preparations, we realized as a team that we were going to be hosting a bilingual event. I remember not feeling brave enough to do this and hearing God clearly say “Help your sister”. There are times where we can be asked to do something that is not comfortable, it lands squarely outside our skill set. In those moments I know that what I am being asked to do may not be my call, but they are my sister! It is your circus, these are your monkeys! Just because you don’t know how to do something or help someone doesn’t mean you can’t pitch in and learn, or offer support. Be brave enough to see someone unexpected as your sister. Then take her hands and steady her knees. Tell her God will come, but in the meantime, you aren’t going anywhere. *Look for Rinse and Repeat (Part 3 of 4) on December 21, 2017. The original article was published in the Blossom Ministries Newsletter, Issue 3 of 2017. This entry was posted in Courage, Memories, Sacrifice, Serve and tagged Bloom Brave. Bookmark the permalink.